Eurozone leaders have begun delicate negotiations to agree further help for Greece and prevent other economies from being dragged into the debt crisis. 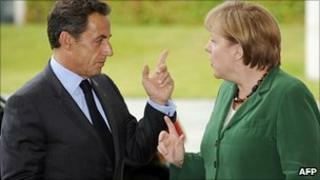 German Chancellor Angela Merkel and French President Nicolas Sarkozy have agreed a common stance, but details of the deal have not yet been released. Comments from the Dutch finance minister suggest the plan may include restructuring Greece's debts. Whether they can convince the rest of the eurozone remains unclear. Jan Kees de Jager said a so-called selective default on Greece's debts was "potentially inevitable". He said French objections to such a default had been "swept under the table", according to the AP news agency. There are also indications that a new tax on Europe's banks to help fund any new aid packages may not be part of any eurozone deal. Arriving at the summit, the head of the Eurogroup of finance ministers, Jean-Claude Juncker, played down the idea of a bank tax. "I do not think there will be an agreement on that subject," he said. Germany has long insisted that private lenders to Greece should be forced to take losses as part of any further rescue deal for Athens. One major bond investor, the German insurance giant Allianz, has called for a restructuring of Greek bonds into centrally backed European bonds, in return for investors accepting a 30% loss on their bond investments. But the suggestion that private investors should suffer losses has been opposed by France and the European Central Bank, which fear it could spark a Europe-wide banking crisis, push Spain and possibly Italy into trouble, and even jeopardise the solvency of the ECB itself. Meanwhile, new figures from Markit's PMI survey show that the eurozone's private sector grew at its weakest pace in almost two years in July, recording a score of 50.8, down from 53.3 in June. Any score above 50 indicates growth. "The eurozone recovery lost almost all of its momentum in July," said Markit's chief economist Chris Williamson. Also on Thursday, Spain was forced to pay a higher rate of interest to borrow money from international investors. Madrid had to offer a yield of 5.9% on 10-year bonds, up from 5.4% at a similar auction last month, in order to raise 1.8bn euros ($2.6bn; £1.6bn). Policymakers are discussing a range of measures at the summit in Brussels, including a new loan package to Greece and the role of private investors in any debt restructuring. But German Chancellor Angela Merkel has cautioned against over optimism. Greece received its first aid package in May last year, but the debt crisis continues to undermine confidence in global financial markets, with some commentators suggesting it threatens the future of the euro itself. Politicians and investors are calling for decisive action to help bring the crisis to an end. "Nobody should be under any illusion; the situation is very serious," European Commission President Jose Manuel Barroso said on Wednesday. "It requires a response. Otherwise, the negative consequences will be felt in all corners of Europe and beyond." Source: Eurostat. Government debt expressed as a percentage of economic output. The Governor of the Bank of England, Sir Mervyn King, has said that the crisis in the eurozone posed the most serious and immediate risk to the UK's financial system. President Barack Obama has also weighed in, calling Mrs Merkel on Tuesday night to stress the importance of tackling the debt crisis in sustaining the global economic recovery. The International Monetary Fund has also called on European leaders to take swift and decisive action. Delaying such action further would be "very costly" for the world economy, it said. However, there are divisions among policymakers about the best way to resolve the crisis. There appears to be consensus on the need for a new loan agreement, analysts say, thought to be similar in size to the 110bn euro ($156bn; £97bn) package agreed last year. However, there is also a growing consensus that this will merely act as a sticking plaster, and that the fundamental problem of Greece's indebtedness needs to be addressed. Athens has already implemented a raft of wide ranging austerity measures, including spending cuts and tax rises, and earlier this month agreed to further drastic action to cut its debt. But there is a growing sense that these will not be enough. The only way to resolve the problem is to restructure Greece's debts, many observers argue. Germany has proposed allowing Athens more time to repay, effectively rolling over existing debts into new bonds. It wants private investors, largely banks, to participate in this restructuring. But the European Central Bank has strongly opposed this plan, arguing that such a rollover would constitute a default in the eyes of the international credit ratings agencies and, as such, would undermine investor confidence and the euro itself. It is these divisions that explain Mrs Merkel's attempts to dampen expectations ahead of the summit.